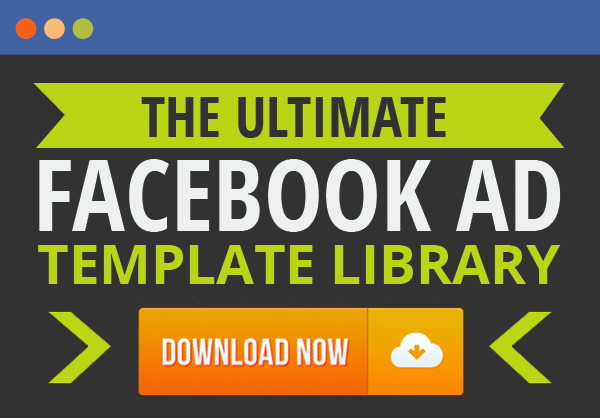 It’s no secret – Facebook is our favorite advertising platform (by far :)). We love Facebook ads because of their ease of use, vast targeting options, and simply because they generate the most leads and sales for our business. 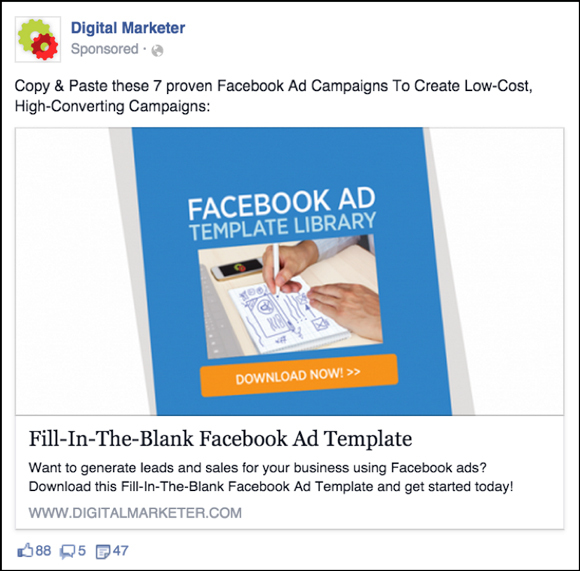 As direct response marketers who love the Facebook platform… we were REALLY excited when, on June 25th, they announced a new ad type: Facebook Lead ads. We were even MORE excited when they started rolling out this new ad type to advertisers last week. Of course, as soon as we were granted access to the Lead ads, we started running as many tests as possible (that’s what makes us different – we actually do this stuff and share the results with YOU :)). But, before we share our data and findings… let’s talk a little bit about Lead ads… what are they and why is this so exciting for marketers? Facebook rolled out Lead ads to help overcome people’s apprehension to filling out forms. The ad looks like a regular ‘ole link ad in your mobile newsfeed. Notice that we made the ad copy more “long form” (you can exceed the normal character limit if you set ads up using Power Editor). We added more copy than usual to this ad because people WILL NOT be visiting your landing page to learn more about your lead magnet (or whatever you’re collecting their information for). They’re making the decision about whether they want to take action based off the information you are giving them in the ad. Keep that in mind… it’s very important. Notice that we took some of the sales bullets from the landing page and simply used them as part of the ad copy. 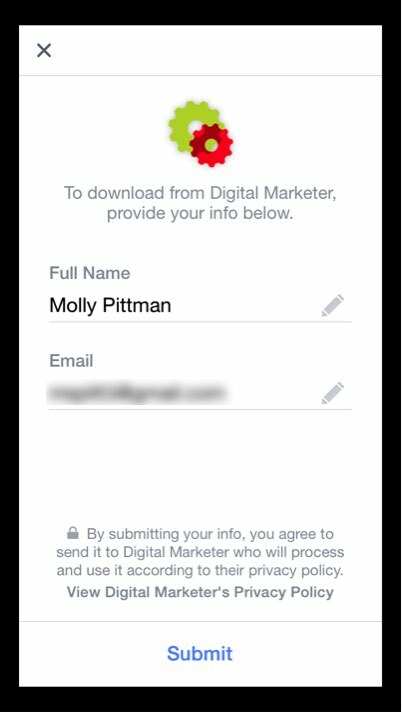 Once users click on the ad, they’re prompted to fill out the form within the Facebook app. 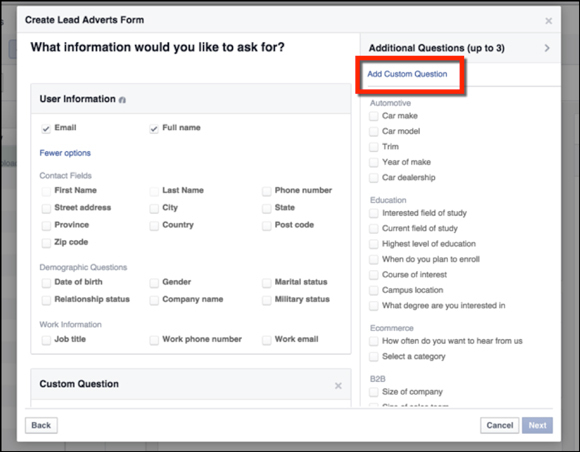 FYI: There are more form field options than just name and email when setting up these ads… depending on your type of business and the goal of your campaign, the sky is the limit here – there’s even a “customize your question” form field option (see below)! Once the prospect hits “submit” – you’ve now collected their contact information! If the prospect clicks “visit www.digitalmarketer.com “ they will be taken to a page to download the resource they opted in for. On the same page, below the download, we also make a low dollar offer to try and convert the lead into a buyer. Keep in mind – they are not automatically redirected to your site after they submit their contact information, so make sure you are delivering whatever you promised via email, too. That’s it – that’s how simple it is to have someone submit a form directly on your ad. Where do you go to actually retrieve the leads you paid for? You can find CSV files of user information by clicking “publishing tools” on the admin side of your Facebook page, and then “forms library”. Now that you understand Lead generation ads and how they work, let’s look at a couple of tests that we ran to see how they perform. 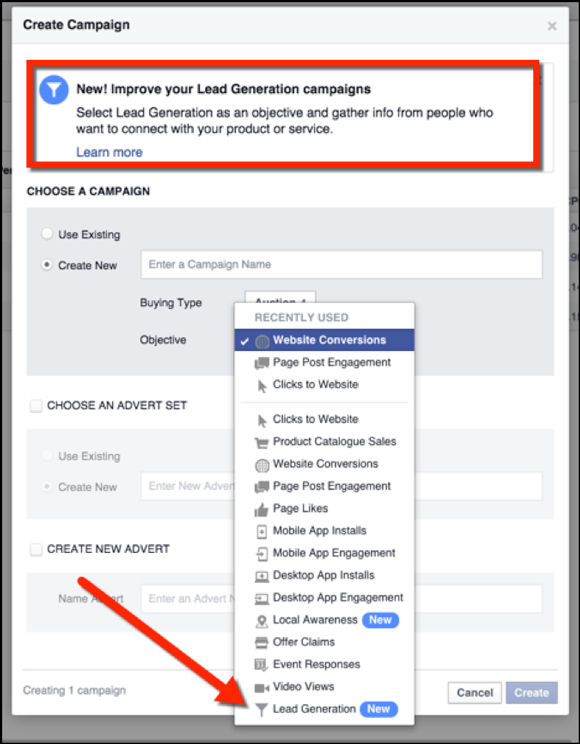 At Digital Marketer, when running Facebook campaigns for lead generation, we’ve always used the Website Conversions campaign objective (based off of lots and lots of tests). 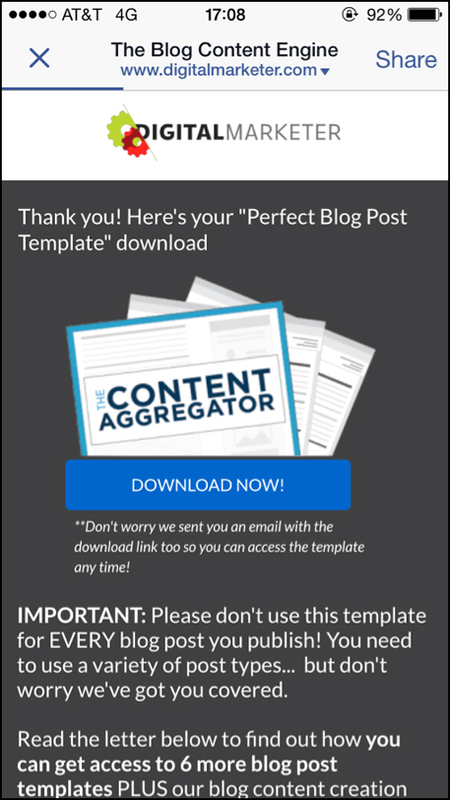 So, when the lead generation ads rolled out – we figured that’d be the perfect split test. The goal of our first test was to see which campaign objective generated the lowest cost per lead. We used the same exact ad copy, creative, placement (mobile) and targeting for both campaigns – the only difference being the campaign objective. We optimized for a freshly installed pixel for the website conversions campaign (in case any data collected on the pixel would affect the campaign). Both campaigns ran for a week. The website conversion campaign was 45% cheaper than the Lead ads campaign. The website conversion campaign generated almost double the amount of leads than the Lead ads campaign. The goal of our second test was to see which campaign objective generated the lowest cost per lead. The website conversion campaign was 16% cheaper than the Lead ads campaign. The website conversion campaign generated almost 8x the amount of leads than the Lead ads campaign. From our initial tests, it looks as though we’ll be sticking to website conversion campaigns for the time being. But, let’s not chalk Facebook’s Lead ads up as a loss. There are plenty of marketers who are having success with these ad types and seeing great results from … that’s why it’s ALWAYS important to run tests within your own business. Different traffic platforms and ad types are going to work differently for some businesses based off of their products/services and their overall goals. Keep in mind that these ad types are BRAND NEW! When users submit their information on a Lead ad, they have the option to visit your site, but it’s not forced. This not only causes confusion on where they should go to redeem whatever they opted in for, it also causes a BIG drop off in your marketing funnel. Instead of someone visiting your landing page, opting in, and immediately hitting a page where they can download what they opted in for and possibly buy something else, you’re missing out on a huge percentage of these visitors. 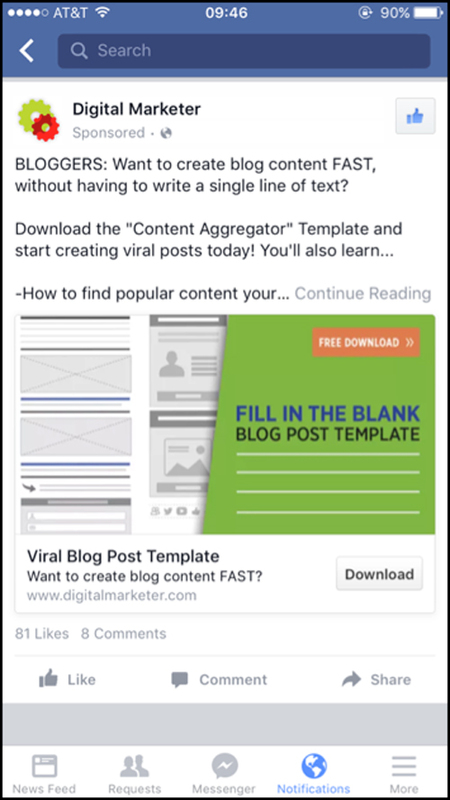 This causes very low ROI on funnels that begin with a lead gen ad. You may be thinking…. Ok, so if they aren’t clicking over to download page.. why don’t you follow up with email? That’s another issue. There are yet to be integrations between CRMs or email service providers to the Facebook platform (unless you’re using a third party tool like Driftrock). So, this forces us to constantly export CSV files of contact information. This doesn’t allow for automation and follow up in regard to lead magnet download or to make the prospect another offer. These ad types should be available on desktop. Our highest ROI campaigns come from people who click on desktop ads. Enough said. 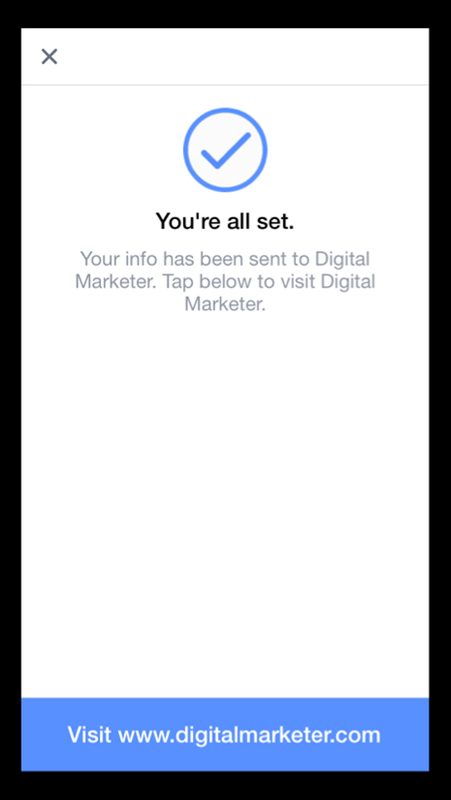 Overall, it’s a very exciting time for marketers on the Facebook platform. Although the initial results yielded a high cost per lead than we’re able to generate using website conversion campaigns, Lead generation ads are still a game changer on the Facebook platform. These ads show a change in the eyes of Facebook. It shows that they’re willing and eager to serve direct response marketers. It shows that they understand that businesses are using Facebook ads to make money… to generate leads and sales, and – that they’re ok with it. That makes us at Digital Marketer very, very happy. Test the new lead ads for yourself and let us know how they’re performing in the comments below. After a few tweaks and further development of this ad type, I have no doubt they will revolutionize the platform.